On Monday, Alan Alda spoke publicly about living with Parkinson’s Disease for the first time since his diagnosis three and a half years ago. He’s known for his work as an actor, author, and science communicator. He joins Ira to discuss his life since his diagnosis, how science informs his perspective on his condition, and what keeps him hopeful about the future. Alan Alda is an actor and writer. He’s a board member of the World Science Festival, and Co-founder and Visiting Professor at the The Alan Alda Center for Communicating Science of Stony Brook University in Stony Brook, New York. 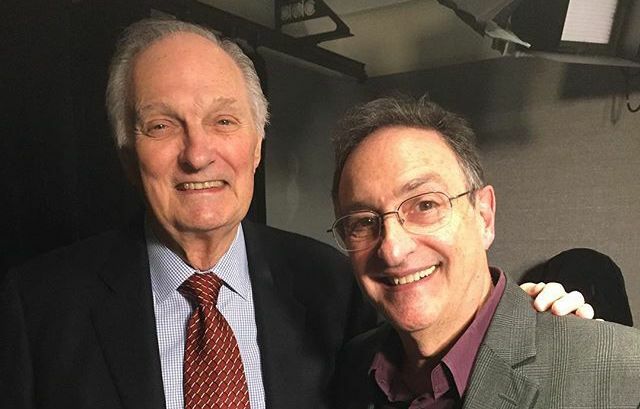 IRA FLATOW: Alan Alda has had many roles in life on stage, television, and in the movies, more recently, as a teacher of Communication at the Alan Alda Center for Communicating Science. And this week, he stepped into a new role as a public figure diagnosed with Parkinson’s disease. Alan Alda is a friend of the show. He’s also here to talk about– he’s got a new podcast Clear + Vivid. Welcome back to Science Friday. IRA FLATOW: Oh, and. I’m such a nerd. I look at plus sign, I think it’s a plus. ALAN ALDA: Yeah, it’s Clear and Vivid. And I love it. I’m having such a good time. I’m interviewing such wonderful people. And in the course in the middle of all of that, I’ve been talking on television a few times lately about Clear and Vivid to let people know that the podcast exists. And I noticed my thumb twitching a little bit. And I thought, it’s clear that I got some neurological thing here. So after three and a half years of– it was three and a 1/2 years ago that I was diagnosed, and I didn’t see any reason to talk about it. But now, I want to make sure that if it’s talked about, that I can get the story out own way, which is a positive way. I’m a little concerned, and I can tell what the culture thinks about Parkinson’s, because I hear it’s coming. And I have a special year open for it. And I feel very, very strongly that it’s not a good idea to assume if somebody that you know, or if you get a diagnosis of Parkinson’s, it’s not a good idea to think, oh, that’s it. Everything is over. And that’s what a lot of people think. Oh, my god. Oh, I’m so sad. That’s so terrible. And then, they’re thinking of the worst case scenario. And most people, or many people anyway. I don’t know what the figures are. But many, many people have years to go. And it’s a progressive disease, but you can slow the progress. It doesn’t go right to the worst possible outcome. And if you don’t get it early, if you are in fear of talking about it, or acting on it, or declaring to another person, like someone who can give you physical therapy, or maybe a group that you have to go to where you’re in a room full of people, and you’re kind of opening up on that part of your life, if you postpone because of that, because of the cultural bias against Parkinson’s, then I think it’s not a good idea. You don’t slow down the progress, and it’s not the end of everything for most people, I think. Now, that’s not to say that there aren’t families suffering with severe cases of Parkinson’s, and that’s painful. But that picture doesn’t have to be the one that guides us when you get a diagnosis. IRA FLATOW: You said that you’ve had three and a half years. Why now talk about it? ALAN ALDA: Well, as I said, I started to see my thumb twitch on television. And I figured it was only a matter of time before somebody puts out a sad story about me. You know? And I think it’s much more important to get out a story, here’s a guy who’s been living with it three and a half years. I’ve acted during that time. I get up in front of audiences and give talks. I’m helping with the Alda Center for Communicating Science. I’m doing my podcast. I’m having the best time. It’s a hit. Isn’t it great? IRA FLATOW: We’re glad for you. IRA FLATOW: And you’re still active. You’re still playing– Diane was saying you play tennis? ALAN ALDA: Well, see, it’s not just that I’m still active. I deliberately do these things because they’re important to slow the progress of Parkinson’s. I play tennis– I try to play tennis singles twice a week. IRA FLATOW: Better than I could. ALAN ALDA: I take boxing lessons three times a week. Boxing is particularly good for Parkinson’s. And I march to John Philip Sousa music, and I juggle. IRA FLATOW: I saw that. I saw the video of you juggling. How long did it take to learn how to do that? ALAN ALDA: Well, I learned when I was a kid. And I’m getting back to it now. And I count the number of times I can keep the ball in the air. So I got up to 24 times. But I made a gif so that it looks like I’m juggling forever. IRA FLATOW: I saw that. ALAN ALDA: If you can’t do it, make it a gif. IRA FLATOW: You’ll have to start spinning those plates now. I heard you say that you were prompted to get tested from reading something in The Times. ALAN ALDA: Yeah. That’s a wonderful example of communication, which as, you know, I’m obsessed with. Jane Brody wrote a column where she quoted two doctors. I guess they’re neurologists, who found that among their patients, having dreams in which you act out the dream while you’re were asleep, you physically act it out, is very often a sign, before any other symptoms show up that you might have Parkinson’s. And so I noticed that, at least on one occasion– actually, several occasions– but one example was, I had a dream that I was being attacked, and I picked up a sack of potatoes and threw it at the attacker. And in actuality, I was throwing a pillow at my wife. I also fell out of bed twice in one week during that period. So when I read that column, I thought, I may have this, and I want to know if I got it. And I went to a doctor and I said, I want a brain scan. And he examined me, and he said, why do you want a brain scan? You don’t have anything. And I said, well, I think I might, and I want to know if I’ve got it, because I want to take action. I want to do something, because I’ve read that there are things you can do. And he called me up. He said, boy, you got it. IRA FLATOW: And your reaction? ALAN ALDA: My reaction was I had to tell my family and calm them down. Because everybody tends to think, oh, my god. This is the worst thing that can happen. And it may turn out to be a terrible thing. Everybody’s got a different flavor of this disease. It seems that no two people have exactly the same version of it. So I may turn out to have a terrible version of it, but I’m going to hold it off as long as I can. It’s reality. You know, you got something, you have to do. For me, it’s a puzzle to be solved. And I’m not going to spend all my time talking about it publicly. I talked about it once on CBS. You got an email to me right away. IRA FLATOW: [LAUGHING] Get in there early. ALAN ALDA: And in a moment of weakness, I said yes. But I can’t be Mr. Parkinson’s. I have to do other things. But on Clear and Vivid, the podcast, I think I might deal with it on one episode, because there are a lot of communications questions about this, how you deal with your family, how you deal with the people who work with you, and that kind of thing, and how we all regard it. It would be healthier for people if we didn’t regard it as such a catastrophe at first, right off the bat. IRA FLATOW: I’m Ira Flatow. This is Science Friday from WNYC Studios, talking with Alan Alda. He’s got a new podcast, Clear and Vision. And you say, is this going to be your last interview about this? You say you don’t want to become the voice or the face of Parkinson’s disease and talk about it all the time. IRA FLATOW: You want to go on with the rest of your life. ALAN ALDA: And I haven’t even got the time to do it. However, I am going to be talking to morning television shows in Australia and in the United Kingdom about the podcast in the next few weeks. So this will probably come up. I can’t avoid it’s coming up in an ordinary interview. Because I do want people to know about the podcast. But I’m not going to– I can’t show up and give speeches about it, and that kind of thing I have so many– I’m awash with things to do. ALAN ALDA: Thank you. I would have never known that you were, you know– it’s obvious you don’t have an advanced case of Parkinson’s. IRA FLATOW: Right, right. And you know, you’re very active. And that’s the way– and you are being proactive in saying, I need to do these things. That’s an interesting point I hadn’t heard before. ALAN ALDA: Well, it turns out that the sooner you do something, the better. That’s why it was good to know about. And I’m glad to have helped spread the word about the acting out of dreams, which I think is also called REM sleep disorder. So I would like to see– and I think, to some extent, judging by what I see on Twitter, there has been a response to this disclosure I made, which is helping other people focus on some of the useful facts about it. IRA FLATOW: And you know, you are the best person to talk about it, because the best part of your life now is being a communicator. ALAN ALDA: It’s so much fun for me to find out more about it and to see– and here’s an example. You’re right. This is an example of communication, because one of the great things about good communication is if you make it personal, it sticks better. People hear it, and they internalize it, because we’re such social animals, I think. And so here’s, instead of saying, the facts are early detection is good, and exercise therapy is important, instead of talking in generalities, I’ve told a personal story. And I think that may help. IRA FLATOW: It does help. And it helps us to communicate with you. And thank you for taking time to come in and talk about it. I’m glad I got my phone call in early. ALAN ALDA: You were pretty quick. IRA FLATOW: You answered it right away. That was great to hear. ALAN ALDA: Well, it’s because I like you, Ira. IRA FLATOW: That makes one. That makes one person. Alan, thank you very much. ALAN ALDA: Thank you. Thanks a lot. IRA FLATOW: Stay in touch. Alan Alda, who is host of the new podcast, Clear and Vivid. And of course, he is also head of the Alan Alda Center for Communicating Science. Thanks again, Alan. Biochemists Miriam Sharpe and Kurt Krause hope to discover the molecular basis for the New Zealand glow worm's bioluminescence.